Temporary Tattoos have become very popular in recent years, and they are safe for children and people of all ages. The advantage of these tattoos is that when one gets tired of the design, you just change it to your latest favorite. Normal tattoos last a life-time and are very expensive to remove. Why not start a small home business applying temporary tattoos? The kits are cheap to buy and the stencils are readily available. It is a great way to make money from home or during vacations. If you need to buy Temporary Tattoos click here for a great selection, from our shop. I recently found a really cool site where one can custom make your own temporary Tattoos. It is really simple, just click on the StrayTats.com graphic, to make your own temp tattoo. Temporary Tattoos take on various forms. For example one gets "transfer" type tattoos that can be wet, with water and then applied to cleaned skin. Another type of Temporary Tattoo is to paint a Henna paste onto skin, (that acts a a die) and stains the skin a reddish brown color for some days. Another type of Temporary Tattoo is to paint on skin, with paints that stay on the skin for some time, (either by Brush or with an Airbrush). 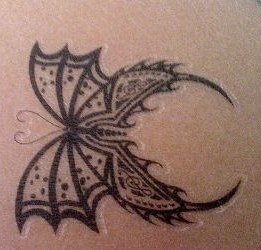 Some companies even sell, skin safe "permanent markers" and stencils that allow people to draw on Temporary Tattoos with stencils to create various designs and patterns. Not to be outdone in the Temporary Tattoo craze, even clothing manufacturers, are now producing tight fitting clothing, that looks like real Tattoos. The advantage is that you are not stuck with them for life, and can "look cool", and yet change your designs as often as you like. 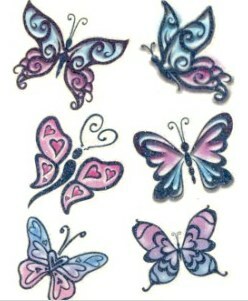 Here is a great DVD on the subject of airbrush temporary tattoos. Body art and temporary tattoos are a wild and interesting art form with growing popularity. Badger's Totally Tattoo paints are water resistant, safe to use, and non-toxic. Alcohol-based for extended durability. 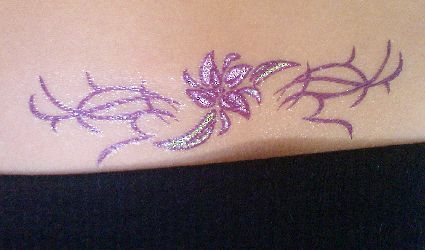 Totally Tattoo Body Paints can be applied with an airbrush or with mini applicators. Can last 24 to 72 hours. Will not wash off in a pool. Easily removed with isopropyl alcohol. One 1-ounce (30 ml) bottle covers approximately the whole of one person's back depending upon how thick the paint is applied. Not recommended for face painting. Starter Primary Set contains 1 oz. ea. of Really Read, Daisy Yellow, Brilliant Blue, Snow White, Bodacious Black, and Go Go Green.Pack of 25 mini applicators or pack of 10 prep pads sold separately. Right now temporary tattoos are the it thing in fasion... From the runways of Paris to the streets of New York, it's all over the globe. Temporary tatoos are removable tattoo designs that go on the skin with water, and can last up to 7 days. These are high quality designs that are fake, but look real on the skin! If you need to remove the design at any point, it is simple to do with rubbing alcohol or baby oil. Removable body art is very cool and popular -- you can use different designs to go with any occasion or outfit. They do not leave any permanent marks like the real thing, so you have the option to change looks regularly! They are completely safe and use only FDA certified colors. Try some on and see what hapens... you never know!!! Want the look of a tattoo but you don't want to face the needle? Temporary tattoos are a great solution for both kids and adults to wear body art and have all the benefits of a real tattoo with out the pain, discomfort and permenent effects. Our selection of temporary tattoos are easy to apply, last a long time and look just like the real thing. No mess application means these temporary tattoos are perfect for kids, they can put them any where! These temporary tattoos can last days with proper care, even after showering yet are easy to remove with baby oil. Each sheet measures approximately 6" x 4". When you buy these temporary tattoos individually you will be sent one assorted style with 3 or more great tattoos on them. A 3 pack includes 3 assorted sheets and a 12 pack includes 2 each of our six styles for a total of over 60 individual tattoos. This 12 pack assortment has you covered with all different types of tattoos from arm bands and small lower back tattoos to arm and accent tattoos you can put anywhere! Right now temporary tattoos are the it thing in fasion... From the runways of Paris to the streets of New York, it's all over the globe. Temporary tatoos are removable tattoo designs that go on the skin with water, and can last up to 7 days. These are high quality designs that are fake, but look real on the skin! If you need to remove the design at any point, it is simple to do with rubbing alcohol or baby oil. Removable body art is very cool and popular -- you can use different designs to go with any occasion or outfit. They do not leave any permanent marks like the real thing, so you have the option to change looks regularly! 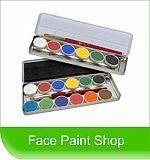 They are completely safe and use only FDA certified colors. Try some on and see what hapens... you never know!!! This set comes with twelve assorted Armband Temporary Tattoos. This full body tattoo shirt emulates traditional Dermagraphic chest plates. Depicted amidst these Poker card images is the King of Suicide and Queen of Diamonds which represents sincerity of bad karma, reflecting the fleeting nature of youth and beauty. These cool Full Body Tattoo Shirts give the illusion of having your upper body fully tattooed and gives you the realistic illusion of tattoos! The newest item from Sleeves,this full body tattoo shirt emulates traditional sailor tattoos that may have been acquired threw out the world. Several of LA & New York's top tattoo artist put their heads together to design this beautiful piece of wearable art. This shirt feature multiple pin-ups, traditional sailor eagles, birds, stars and even a full blown ship. Amaze everybody who sees you in this great dermographic tattoo shirt! All sleeves clothing in hand made and carefully individually crafted so each shirt appears seamless for a real tattoo looking effect. These shirts are all movie quality tattoo emulation, that means every one who sees your new tattoo shirt would never think they aren't real tattoos. Please order one sizer bigger than usual due to these shirts running small.